Groundhog control is extremely important. These nuisance animals, also known as Woodchucks, can remove 700 pounds of soil to complete a 20 to 25-foot-long burrow with multiple chambers that pose a serious threat to homes by damaging and undermining building foundations. Groundhogs can also cause extensive damage to home gardens eating about 1/3 their weight daily. Groundhogs \ ' graun(d)- , hog) Also known as woodchucks or marmots, they are the largest members of the squirrel family. These rodents gorge themselves all summer and after the first frost, they retreat to their underground burrows until spring, drawing their sustenance from body fat. Usually groundhogs breed in their second year, but a small proportion may breed in their first. The breeding season extends from early March to mid or late April, shortly after hibernation. A mated pair remains in the same den throughout the 28 to 32 day gestation period. As the birth of the young approaches, the male leaves the den. One litter is produced annually, usually containing 2 to 6 blind, hairless, and helpless young. 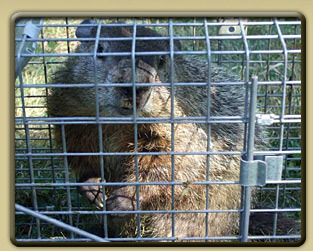 Young groundhogs are weaned and ready to seek their own dens 5 to 6 weeks. The lifespan of a groundhog is approximately 2 to 3 years but they can survive up to 6 years in the forests and up to ten years in captivity.